Prepared by Walter Silbert, MD and Maroun Karam, MD, Department of Radiology, Albany Medical College, Albany, NY. A 51-year-old white man with a medical history significant for Type I diabetes mellitus and peripheral vascular disease necessitating multiple prior distal amputations presented with increasing right foot pain. He reported no recent trauma or corticosteroid therapy. Physical examination revealed prior transmetatarsal amputation and a large nonhealing ulcer that penetrated deeply to the lateral aspect of the ankle. In addition, erythema, warmth, and edema of the leg and foot were noted, leading to a strong clinical suspicion of osteomyelitis. 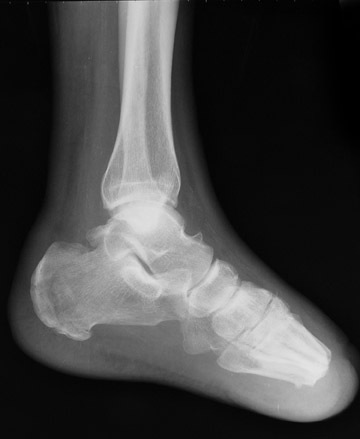 Radiographic examination revealed a mildly dis-placed fracture of the calcaneal tuberosity (Figure 1). Focal bone lysis and periosteal reaction typical of osteomyelitis were not appreciated. However, they may not be detected for 7 to 14 days. 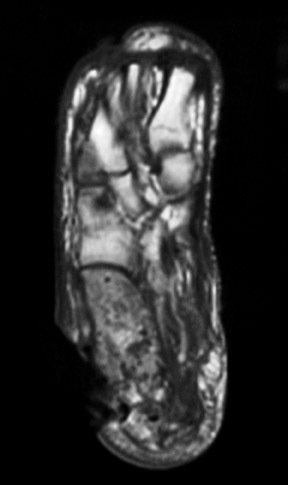 Given the strong clinical suspicion of osteomyelitis, a technetium-99m methylene disphosphonate three-phase bone scan was requested, which revealed increased blood flow and soft-tissue uptake in the right lower extremity and a photopenic focus in the region of the calcaneal tuberosity on delayed imaging (Figure 2). 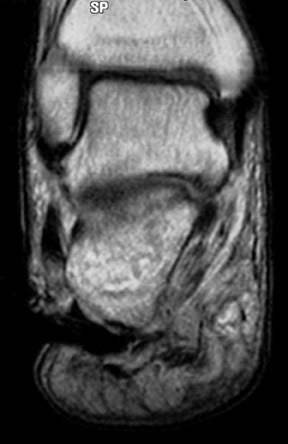 A diagnosis of lower extremity cellulitis and aseptic necrosis of the calcaneus was suggested. 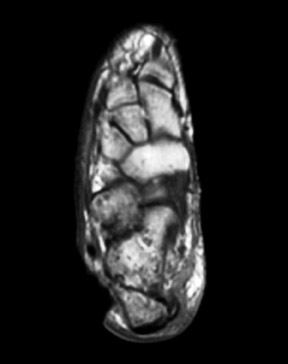 Subsequent magnetic resonance imaging (MRI) revealed mild diffuse marrow signal abnormality within the posterior calcaneal fracture fragment. However, there was no localized area of intense marrow infiltration along the lateral aspect of the calcaneus abutting the nonhealing ulcer to support the diagnosis of osteomyelitis (Figure 3A). In addition, anterior to the fracture line, a serpiginous region of low signal intensity was seen on both T1- and T2-weighted images, corre-sponding to the photopenic area on the bone scan, a specific characteristic of a bone infarct (Figures 3B and 3C). A lower extremity angiogram revealed occluded anterior and posterior tibial arteries with reconstitution of the dorsal and plantar arches via collaterals. Although nonspecific, a cold defect on a bone scan is suggestive of bone infarction in this clinical setting. 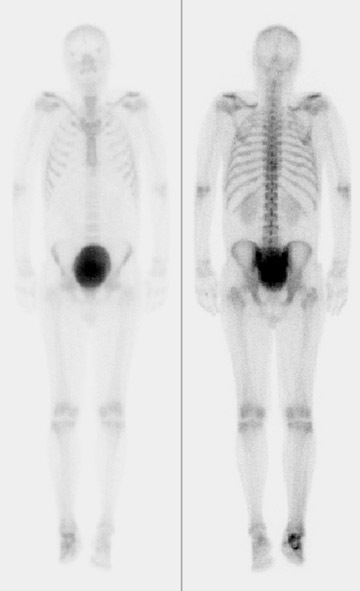 The diagnosis was confirmed in this case by MRI. Early and accurate diagnosis of bone infarction facilitates appropriate management, reducing the risk of bone collapse and secondary degenerative disease. Calcaneal bone osteomyelitis. Appl Radiol.